Recreational paddles for use with Sit on top, Recreational touring kayaks and inflatables. 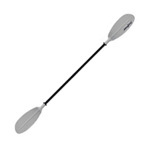 Generally these paddles are in the 220cm length range and are ideal for rivers, lakes, estuaries and the sea. Great value for money introductory paddle with alloy shaft & assymetric plastic blades. A very good value for money low angle bladed paddle with glass fibre shaft and plastic blades. Superb entry level kayak paddle to get your kids on the water. Alloy shaft and assymetric plastic blades. A mid size sea kayak paddle with nylon blades and glass fibre shaft. Perfect for touring and sit on top paddling.